After being poorly served on DVD in the UK, classic film noir titles have been enjoying a new home on the Blu-Ray format. This has been great for a fan like me who loves the style but hadn’t actually seen many of the genre’s entries until relatively recently. 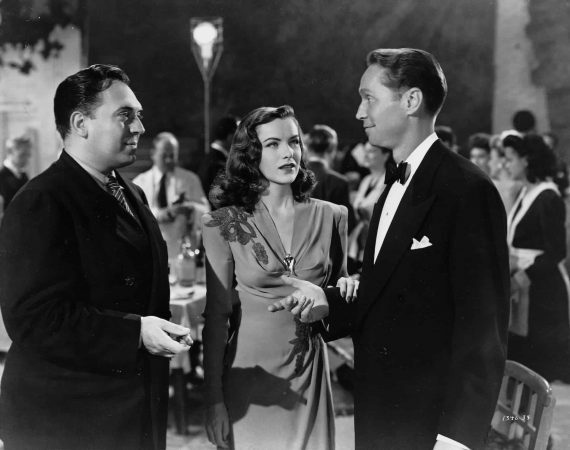 I’ve managed to catch up on a lot of big-name noirs like Laura and The Big Heat, but I’ve also particularly enjoyed discovering less well known titles (to me at least) like Odds Against Tomorrow, My Name is Julia Ross and French noir like Panique. 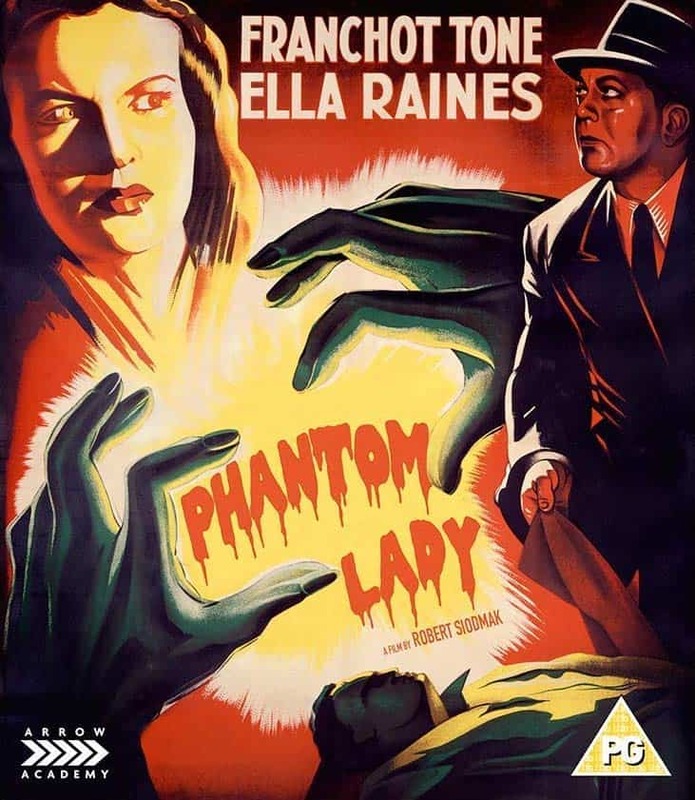 Another that I’d not heard of but gave a try due to my love of the genre was Phantom Lady, which Arrow Academy is releasing on Blu-Ray. I’d previously seen and enjoyed a couple of the director Robert Siodmak’s other noirs too, so I was keen to discover more. 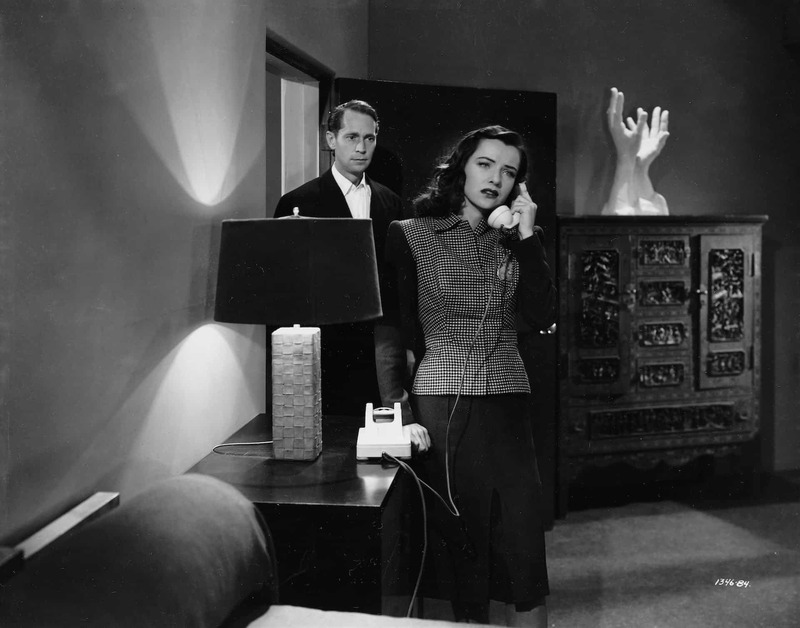 Phantom Lady opens with an intriguing setup. A man, Scott (Alan Curtis), who’s been stood up on a date to the theatre, asks a lonesome looking woman (Fay Helm) if she’ll join him instead. She agrees, but refuses to let Scott know anything about her and they part ways at the end of the night. When Scott returns home he finds the police waiting for him, along with the dead body of his wife who has been strangled by his necktie. 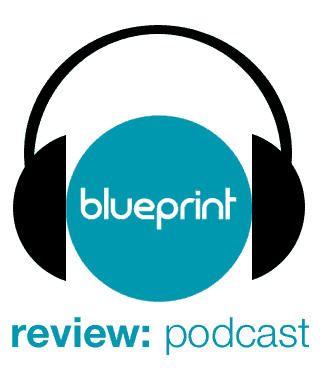 Scott’s alibi of being out at the theatre can’t be collaborated, due to the mysterious nature of his partner for the night, so he becomes the chief suspect, particularly after the police learn of the rocky relationship he’d shared with his wife. 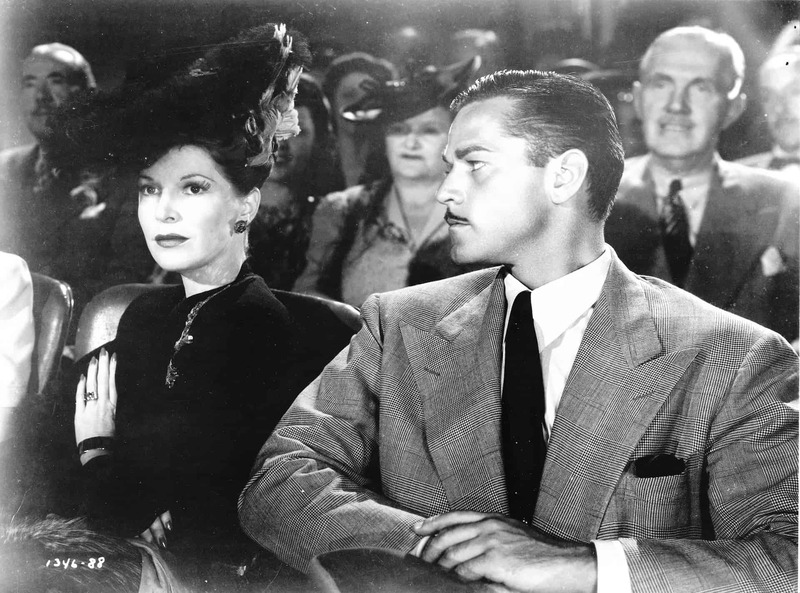 Scott is found guilty in court, but his secretary Carol (Ella Raines) knows he must be innocent and sets out to find the mystery woman and get him out of jail. Her task becomes more difficult and dangerous as the real killer is made known (to the audience at least) half-way through. This is a real gem. The concept is simple, but very effective. Before the hunt for the mystery woman grows stale, the reveal of the killer to the audience adds suspense and stakes to the drama. Indeed, the film has some very tense and frightening sequences as Carol gets herself into ever more dangerous situations. These get pretty dark for a film of its age too. In one scene she flirts with a drummer (the excellent character actor Elisha Cook Jr.) to get close to him and gain information, but the character’s sexual desire is barely contained on screen (highlighted in a furious jazz drumming scene) and he seems set to use force to get what he wants. The film’s true villain (played by Franchot Tone) is sadistically portrayed too, although his ticks and not-so-subtle dialogue hints about his sanity are rather over-the-top by today’s standards. What isn’t over-the-top is the way the film uses reactions and suggestion to tell a lot of the story. It doesn’t sound like anything special, but I found more was shown than said here than in most films of the era. Notable examples include the horny/flirtatious glances of the drummer, the damning stare of Carol as she hounds a bartender who kept information from the police and the horrified/distraught look of Scott as the (unseen to the audience) body of his wife is carried away. Siodmak lets his actors and his camera tell the story instead of relying on clunky explanatory dialogue. There’s some nicely atmospheric, shadowy noir lighting used too. Characters are effectively spotlighted at key moments and there’s a gorgeous shot of Carol visiting Scott in prison that reminded me very much of a similar scene in the Coen Brothers’ The Man Who Wasn’t There. Overall then, it’s an engrossing mystery thriller with a particularly dark edge and fine direction that shows rather than tells. With some impressionistic lighting and decent performances, it’s top-notch noir that deserves greater recognition. 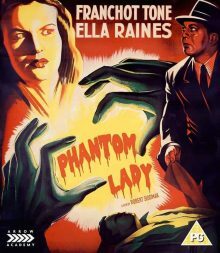 Phantom Lady is out on 4th March on Blu-Ray in the UK, released by Arrow Academy. The picture quality is a little disappointing with quite a few visible flecks and scratches throughout. It’s an old and relatively obscure title though, so it could be a lot worse and it’s still a sharp and detailed picture. I’m not generally interested in the radio adaptations often included with the extras, so there’s only one piece of note to me in this package, the ‘Dark and Deadly’ documentary, but it’s an excellent addition. Made in the 90s, there’s a big focus on the neo-noir boom of that decade, but that interests me and there’s a lot of nostalgic and occasionally intriguing commentary on the genre as a whole. I didn’t receive a copy of the booklet to review. 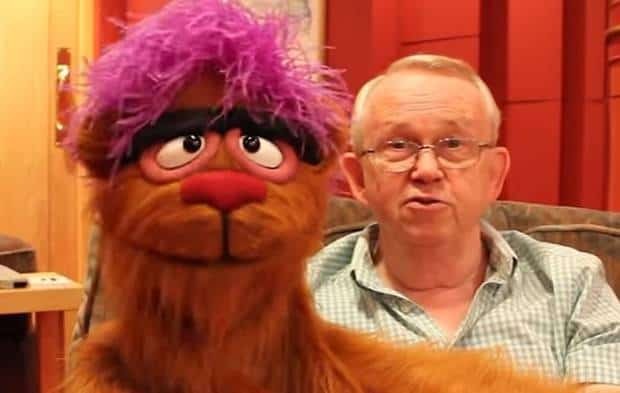 Editor of films and videos as well as of this site. On top of his passion for film, he also has a great love for music and his family. From knowingly silly fun .